The girlfriend wants to say open and close. Yes on and of work. I think that is a limitation of the echo. It is. It works sometimes but not always. In reference to Open/Close in Echo. I just say “Alexa, set the shades to 100%”. It is oddly more natural than “Alexa, turn on the shades.”. Echo native commands is not reliable for devices it doesn’t support such as blinds. You are better off using IFTTT so you can say “Trigger Open Blinds”. I am trying to use the shades in Apple’s HomeKit using HomeBridge and your code shows the shades as lights - I’m not able to edit it to be shades in HomeKit. Do you have any recommendations on finding a solution? My goal here is to tell Siri to close or open all the shades without specifying the device names. I don’t use Siri so I don’t know if this will work, but I updated the device handlers to support the Window Shade capability. You will need to update from github. This device handler needs a zwave to RFS like this one? It depends on your shades. The new Bali and Graber blinds don’t require it and are zwave native. 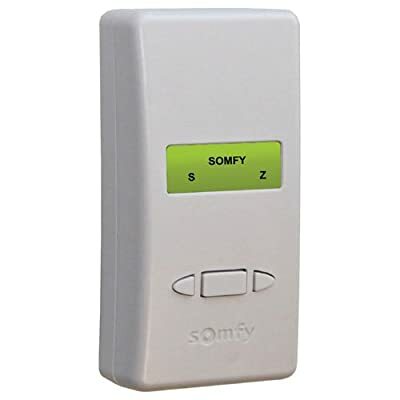 I understand, but if I have a somfy RTS for my horizontal blinds, how do I connect the RTS to the zwave? Using that wall module I posted above? I think that device pairs directly with SmartThings. There is another thread about it, I don’t have one. But i’m preety sure you said you tested with a somfy controller. I have only tested it with the Somfy controller. I did. I meant Somfy blinds not the Garber. Mine are the new ones, not the ones that require that device. Do you know if there’s a stand alone motor from Somfy (to exchange mine) that works like yours? But going back to the app. Does all this functions work also with the ZRTSI or only with these brand new blinds that come with zwave? I’ve tested on a couple of shades and have some questions. Can the Shady device handler be used for individual shades or just groups? How do you execute the top and bottom align feature? The shady device can virtually control a single shade if that shade is paired to ST and has a real device handler. If you are looking for a DH for a single shade / blind take a look at this one. If you press the button for align top the shades within the group will go to the highest level of all the shades. So for example, if you have 3 shades. When you hit align top Shade 1 will do nothing, Shades 2 & 3 will got up to 85%. Make sense? Is that not working? I have that device handler installed also, but didn’t see the top and bottom align on it, so figured I would add Shady for the individual shade. With the explanation of the alignment in a group I can use Z-wave handler and Shady for the groups. I have only tried to align a shade as individual and not in a group. I’m just getting started with ST in a new construction house. I plan on grouping rooms and floors to include all 43 shades, but also have request from my wife to have sub-groups within the rooms so she can have Echo close the (West shades group) within that room in the afternoon. Does my plan sound logical for function? If you are only working with a single shade, what would you align it to? Does my plan sound logical for function? Yes, shady groups will allow you to do this. Using echo you can control your sub groups. If you have extra remotes you can also program them with smartthings and have them control sub groups.